Increasingly, researchers are expected to actively manage their research data throughout the life-cycle of scholarly interest. 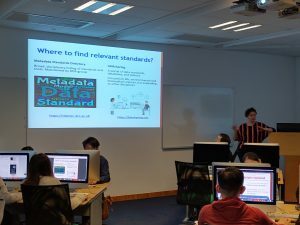 Learning research data management best practices has become essential, especially for early career researchers.This week, two research data management (RDM) specialists from the Digital Curation Centre in the UK are visiting HKUST. They conducted a half-day workshop for about 30 PGs and research staff members on Monday, going through RDM skills, benefits of open data and the FAIR principles. 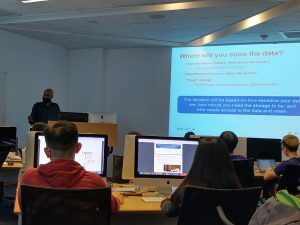 In the workshop, Dr. Venkataraman walked through the research life-cycle with us and explained RDM skills at each stage. Below are some key points. His full presentation is here. Ensure consent forms, licences and agreements don’t restrict opportunities to share data: without proper consent, data repository or data centers will not be able to accept your data. Choose appropriate file formats: open, lossless formats are more sustainable (e.g. csv, rtf, tif, wav). Proprietary and/or compressed formats are less preservable but are often easier to use during data analysis stage (e.g. xls, doc, jpg, mp3). Adopt a consistent file naming convention: to make future file management easier, especially when your data grows in volume and versions. Metadata describes datasets, it helps identification and citation. Documentation provides information about the background and structure of the data; it aids future reuse. In your documentation, explain why and how you create the data, and include the codes that you use to handle the data. Keep your data secure by storing your data in a managed server with access control. Consider secure data services for long-term sharing. License your data openly using Creative Commons Licenses. Deposit date at collaborative platforms such as OSF, and/or data repositories with subject specialization or institutional-based. HKUST researchers can use DataSpace@HKUST maintained by the Library to deposit and share research data. 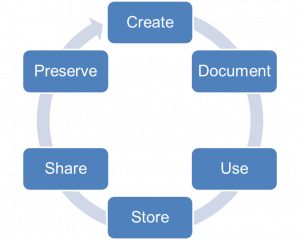 Making backups and archiving are two different activities on preserving your data. Take periodic snapshots of data as backups on a somewhat frequent schedule; follow the 3-2-1 principle: “3 copies, 2 different media, 1 off-site”. Archive the final version of your data for long-term preservation. The instructors led a discussion about the benefits and risks of making data open for sharing and reuse. Ms. Jones explained the concept of FAIR data: making data Findable, Accessible, Interoperable and Reproducible. FAIR data is not necessarily open; and open data is not necessarily FAIR. It was a fruitful workshop. We thanked the two DCC experts for opening the discussion on RDM at HKUST.